"Once you've had one, you'll want another. The recipe is a little different from most burrito recipes, but I've had many, many requests for it. Serve these with sour cream, chopped green onions, and salsa." Heat oil in a medium skillet and saute onion and garlic until soft. Mash beans into the onion mixture. Gradually stir in water; heat until warm, 2 to 3 minutes. Remove from heat and stir in the soy sauce, chili powder, mustard, cumin, and cayenne pepper. 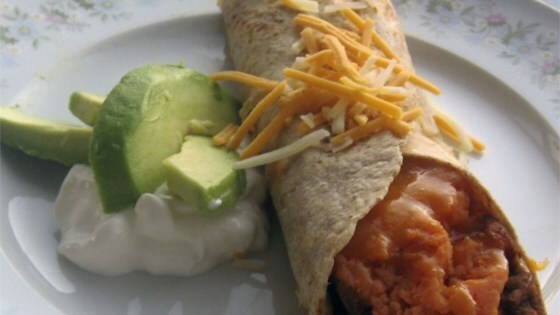 For vegan burritos, omit the cheese and sour cream. These may be made ahead of time, individually frozen, then heated. For an interesting variation, try deep-frying these tasty burritos. Awesome, but I would used refried beans next time so avoid the hassle of mashing the kidney beans.